Unison Research Unico Primo is a hybrid stereo integrated amplifier capable of comfortably delivering 85W RMS continuous power to an 8Ω load. Despite its entry-level status in the Unico line, Primo possesses many outstanding qualities of more high-end amplifier models. By utilising a hybrid design that combines a power amplifier and an ECC83 triode, you get enough power to drive most loudspeakers with sound quality and performance that can only be achieved with advanced valve designs. The input and preamp stages are designed to suit an ECC83 (12AX7) valve, while the driver and power stages are based on well-established solutions used in previous higher-end designs. The power supply has been revised to increase the power transformer and filter capacitors for improved dynamics, bass response and drive capability. 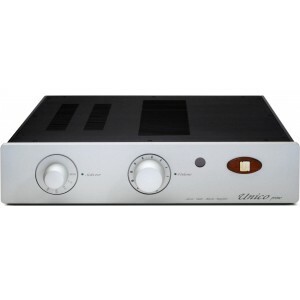 The Unico Primo is designed to accommodate all modern and traditional sources, with its four Line inputs and dedicated Phono (MM/MC) input for connecting a turntable. There is also a Tape Out option and an active stereo output for a connecting a powered subwoofer to your system. Switching between inputs is easy with the stylish dial on the front panel, and volume control is managed by the large, smooth rotary pot in the middle of the face-plate. The casework is based on other models in the Unico range, and the faceplate is similarly fashioned and supplied in Unison Research's iconic sandblasted silver finish. The aluminium front panels are clean and stylish thanks to a new sandblasting and anodising process. The sandblasting consists of hammering the aluminium plate with microscopic ceramic balls at room temperature to give the surface a homogeneous and opaque finish. The anodising process facilitates the growth of a thin film of aluminium oxide on the surface, which enhances the mechanical resistance and hardness of the surface. The end-result is truly stunning to help round off this prestigious piece of equipment.